With the western half of the US experiencing historical drought levels, it’s time to get serious about reducing our water footprint, and one very practical way to do so is through a rain catchment system. These setups can easily provide water that would be otherwise lost to landscaping, holding collected rainwater until it’s needed. Your average homeowner can have one working in a few minutes. And for those who want to get more advanced, catchment systems can even provide water for indoor uses, although you’ll need some more complicated equipment if you hope to use collected water for potable purposes. Here are the basics of simple rain harvesting systems, with some information about more complicated setups as well. The beauty of a rain catch system is that it can be as simple or as complex as you want it to be. The most basic systems are made up of a rain barrel placed beneath the downspout of a gutter. When it rains, the water running off the roof pours into barrel and fills it. The collected water can then be applied for nonpotable purposes—outdoor activities like watering a garden or washing your car. It’s an efficient strategy, since it’s estimated that landscaping accounts for a shocking 40 percent of water use. Store-bought barrels are made from plastic, fibreglass, or stainless steel and include a spigot where a hose can be connected. An average sized specimen holds between 40 to 55 gallons, and can be filled by just one hard rain. That means you might want to invest in a handful of barrels so that you can rotate a new one in every time a storm moves in. Because barrels fill so quickly, the surrounding area can easily grow soggy from overflow, wrecking the sod around the base. To avoid problems with your lawn, dig a four-inch-deep trench that runs the length of your barrels, then fill this trench with pea gravel. Next, place cinderblocks to form a small platform on top of the gravel, and put your barrels on top of that, giving the excess water some place to drain. Of course, standing water tends to draw mosquitoes. Keep them at bay the natural way by planting a few pest-repellent plants nearby. While citrosum is the traditional go-to plant for mosquito repellent, lemon balm, lavender, and basil will all do nicely as well—and they smell great, too! Rain barrel water catch systems work great for households that want to use the harvested water for nonpotable purposes. But what if you’d like to shower with captured rainwater or use it around your home? In that case, a much more advanced rain catchment and filtration system is called for. That means first taking a look at your roof. Not all roofing materials are created equal, especially when it comes to keeping water safe and mold-free. For instance, older metal types may contain lead, while asphalt tiles can attract pollutants like mold. And then, pollen, dust, and other contaminants pose a problem no matter what kind of material your roof is made out of. 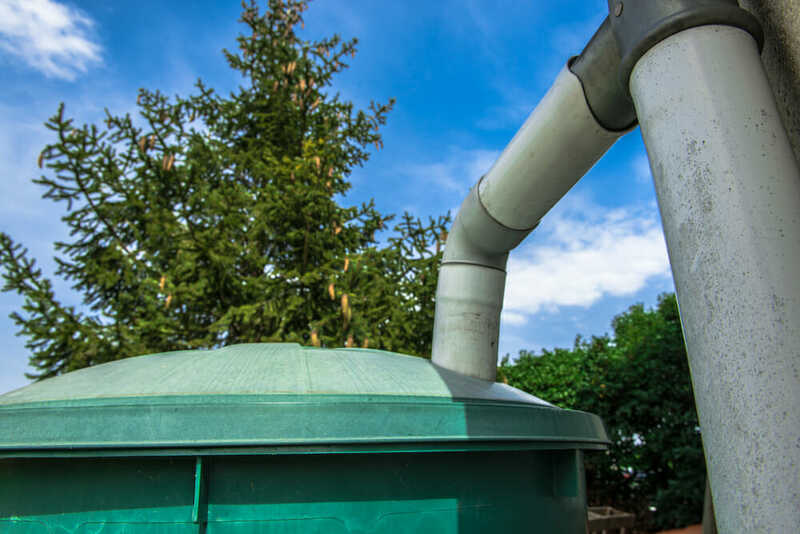 That’s why heavy-duty rain catch setups include what’s known as a first-flush diverter—a system for capturing and removing the first wash of runoff from the water tank. Generally, first-flush diverter systems have piping attached at a T-joint. One end of the joint is a closed pipe—this holds the first runoff. When filled, the water flows down to the second side of the T-joint and into a cistern or large barrel. Households that use harvested water inside also have a pump connected to the cistern that can provide pressure to bring the water into the home, and generally, a series of ultraviolet filters that purify the water so that it is clean enough to wash in or drink. The ultraviolet light targets microorganisms and kills them, sterilizing the water. While these are the basics of a larger rain catchment system, we recommend doing thorough research before attempting to set one up on your own or purchasing one for use in your home. Bathing or washing with contaminated water poses a huge risk to your health, and standing water can attract mold and other pests that could cause serious issues. Meanwhile, if you live near a city, rainwater could be polluted with toxins. It is definitely the kind of job you’d need to do your homework for, or even involve a professional. 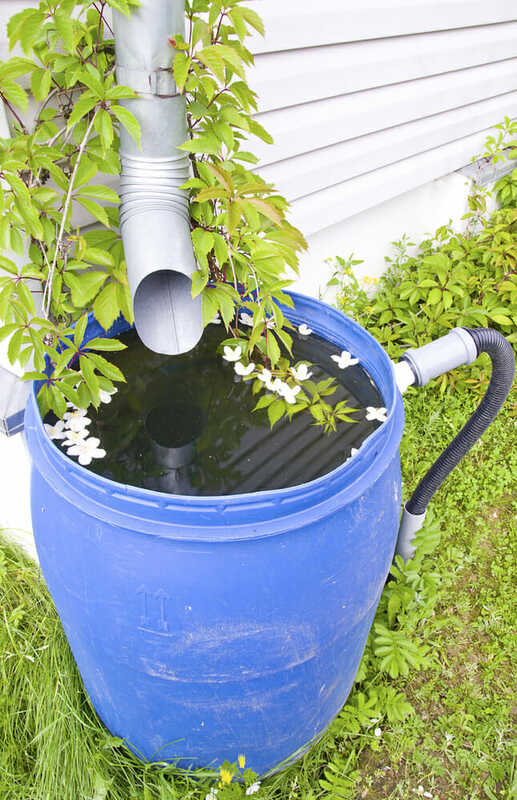 However, if you’re looking for a simple collection system, a home rain barrel is a very reasonable choice that can be installed in mere minutes and will lower your overall water usage, keeping the water table robust.